Jamal Khashoggi disappearance: Turkey newspaper shows photos of purported Saudi "assassination squad"
ISTANBUL -- A newspaper close to the Turkish president published photos Wednesday of what it said was a 15-member "assassination squad" allegedly sent to target Saudi journalist Jamal Khashoggi, who went missing after entering the Saudi Consulate in Istanbul last week. Turkish officials suspect Khashoggi was killed at the Saudi consulate, allegations rejected by Saudi Arabia, which says he left the premises. Turkey has been given permission to search the diplomatic post, an extraordinary development that shows the increasing international pressure the kingdom faces over Khashoggi's disappearance. The visit by the Turkish officials, including a public prosecutor, was reportedly delayed on Wednesday, however, upon a request of the Saudi government which wanted to give its ambassador in Turkey time to arrive. The search was still expected to take place on Wednesday. The report by the Sabah newspaper, which is close to Turkish President Recep Tayyip Erdogan, published images of the men apparently taken at passport control. 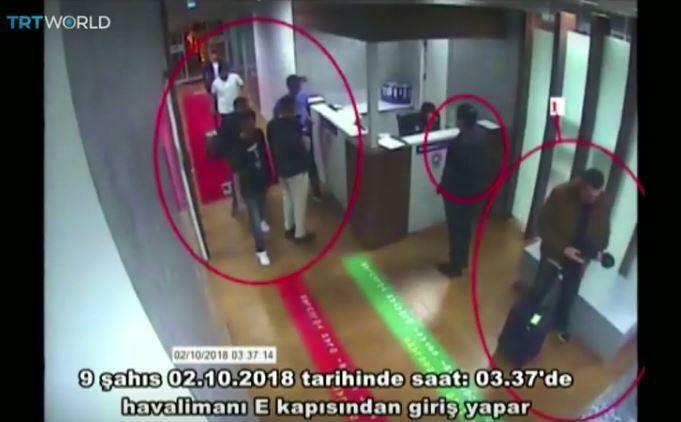 It said the men, who were named by the paper, checked into two hotels in Istanbul on Oct. 2, the day Khashoggi went missing, and left later that day. The New York Times went further on Wednesday, citing an unnamed Turkish official as saying an order to kill Khashoggi had to have come from the highest levels of the Saudi royal court, given the complexity of the operation. The official told the Times that most of the 15 Saudis who came to Istanbul on the day Khashoggi disappeared had been identified by Turkish authorities, and that among them was an expert in autopsies who might have helped in dismembering the journalist's body. The official told the Times that a bone saw was among the items brought into Turkey by the group. "It is like 'Pulp Fiction,'" the official told the newspaper. The Post wrote an article on Wednesday citing an unnamed U.S. official who said American intelligence agencies intercepted communications by Saudi officials "discussing a plan to capture" Khashoggi. The Post said it was not clear from its intelligence source whether U.S. officials had shared with Khashoggi the apparent threat, or whether they knew from the intercepted communications whether the intention was to detain and question the journalist, or kill him. On Wednesday, the Post published a column by Khashoggi's fiancée, Hatice Cengiz. She acknowledged the writer first visited the consulate on Sept. 28 "despite being somewhat concerned that he could be in danger." He later returned Oct. 2 after being promised needed paperwork so the two could be married. Cengiz appealed directly to President Trump to help find out what became of Khashoggi. In an interview with journalist Hugh Hewitt published Wednesday, Vice President Mike Pence said the missing Saudi writer's fate was "a great concern for the United States of America." Asked by Hewitt if the U.S. would send and FBI team to help in the investigation -- if the Saudis requested such assistance -- Pence said, "the United States of America stands ready to assist in any way. But as I said yesterday, the free world deserves answers. And the reports that a Saudi Arabian journalist may have been tragically murdered in Turkey should be deeply concerning to everyone who cherishes a freedom of the press and human rights across the globe." Video broadcast Wednesday by Turkey's TRT World network shows a private jet landing at Ataturk airport in Istanbul early on the morning of Oct. 2 and the 15 purported Saudi security officials going through security there. Other images broadcast by the network purportedly show the same group of men at the two Istanbul hotels. There was also video of a Mercedes Benz van dropping off some individuals early that morning at the Saudi Consul Mohamed al-Utaibi's residence in Istanbul. According to Al Jazeera television, Turkish officials have also asked to search that property. A surveillance video image surfaced Tuesday showing Khashoggi walking into the consulate in Istanbul's upscale 4th Levent neighborhood. No evidence of him leaving the consulate has been made public, but Turkish officials also have yet to provide evidence he was kidnapped or killed.